This product will delight your taste buds and enhance your dishes. Use: place a knob of butter on grilled meat, on canapés with an aperitif, fresh pasta, boiled potatoes, as an accompaniment to fresh oysters, etc. 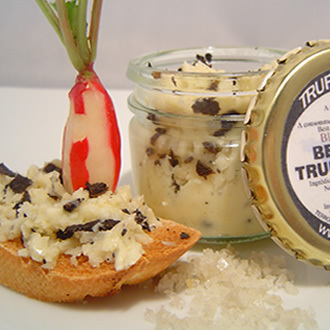 Ingredients: Echiré butter (85% min), black truffles (3%), black truffle aroma, salt, pepper. Fresh product: Your product will be shipped in isothermal packaging. Consume within 1 month.